Gong Xi Fa Cai - San Diego Dining Dish! Gong Xi Fa Cai! Or Happy Chinese New Year! Also known as the Lunar New Year, the Chinese New Year starts this February 19. For the Chinese culture, this is one the most important traditional Chinese holidays celebrated every year and begins on the second new moon after the winter solstice. 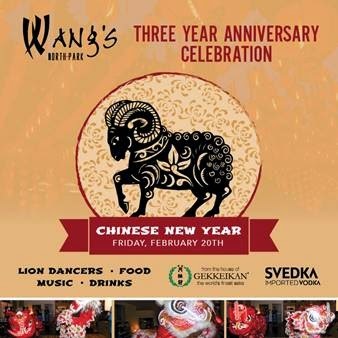 To celebrate, on February 20, San Diegans are invited to ring in Chinese New Year withWang’s North Park , the largest Chinese restaurant in San Diego. And better yet, they’ll also be celebrating their third anniversary! Free to the public, walk the red carpet into one of San Diego’s biggest events for the holiday. Sip on sake samples while munching on passed hors d’oeuvres of traditional “lucky” New Year’s dishes such as whole fish, noodles and dumplings. At 9 p.m., don’t be afraid when loud drum beats and cymbals begin. Traditional lion dancers (nope – those aren’t dragons!) are scheduled to perform, evicting the evil spirits away and ushering in a prosperous New Year. Dinner reservations will also be available all night for those wanting to continue the party.